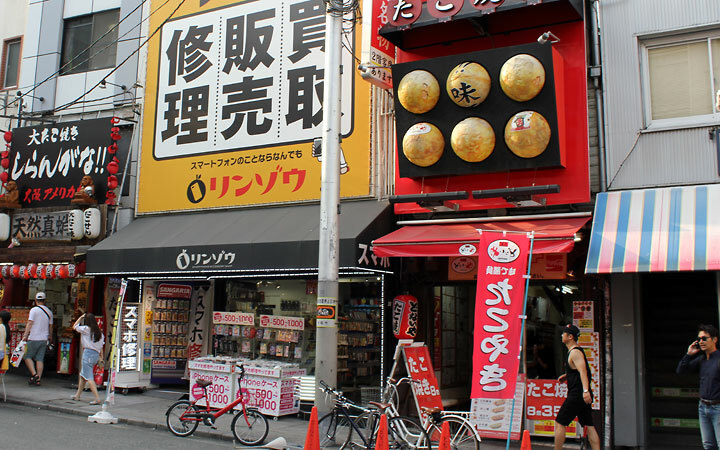 Sometimes written as Dotomburi, Dotonburi is the most popular tourist destination in Osaka. It’s a busy place with crazy big signage. Parallel to it is the Dotonburi canal. It’s neat to walk along there, a lot of shops and restaurants. That crab means I’m at the right place. Looking for balls? There they are! Shopping district. Need I say more? Just minutes from Dotonburi. Marked by a smaller replica of the statue of liberty on top of a building, Amerika-mura is Osaka’s America town. I didn’t see anything too fascinating here. It is said that street culture in Japan emerged here. View from under the building. The two protruding bits are the escalators that take you up and down the observatory. Inside, I watch a video describing how they built and elevated the middle observation deck, the “Floating Garden Observatory”. It was assembled on land and hoisted by crane up to the top, and then secured. The whole lifting process took 7 hours (if I recall correctly). It is kind of neat to realize I am in the observatory 20 years later, as I watch the video. At the top, an area for lovers to lock in their love. Close up of the locks.